Oh, no, what a bad t-shirt. 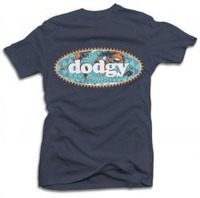 I'd love to know what non-english speaking people make of the word "dodgy". Does it really translate? It's quite slang. That's not only horrid but also confusing. Just a very bad t-shirt. Dear lord, what were they thinking? If I won one of these I would tear! Hahaha. Okay. Not a t shirt per se, but seriously? ?